You'd take school cloaks over school uniforms any day. Your obsession with The Boy Who Lived has toppled over into every aspect of your life, which is completely fine since a hint of magic makes everything more exciting, especially your wardrobe. In just the nick of time, Hedwig is swooping in to create a beguiling ensemble with the help of the Hedwig feather earrings. 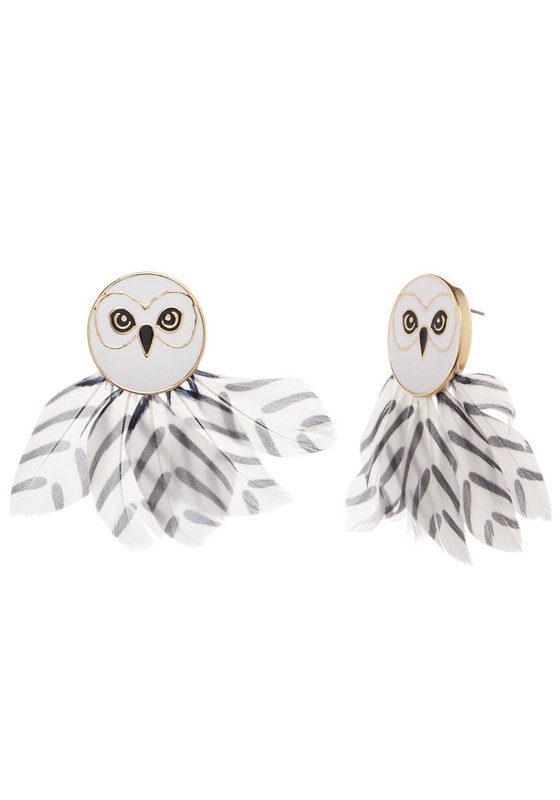 Just like the real deal, these Hedwig earrings will always be there for you, elevating your entire outfit to all new heights. Will they save you from a soulless Dementor's Unforgivable Curse? Not quite, but they'll always save you from making a major fashion faux pas. The Harry Potter Hedwig feather earrings are officially licensed and created to look like Harry's beloved pet and companion. The black and white feathers dangling from the circular Hedwig studs are approximately 1-inch in length and soft to the touch. These earrings attach to ears via a post-style backing. Slip them on and fly off! Wear these earrings with a House robe or your favorite Potter tee. Accent Hegwig earrings with a Hogwarts letter handbag or a Deathly Hallows necklace set.